I live in Dubai, where fruit is really hit and miss to say the least. It can be expensive, tasteless, more well travelled than me, or a combo of all 3. My way around this is pretty simple. If I’ve once again made a crap purchase of tasteless fruit, I roast it. Stone fruits, figs, apples, pears, even grapes. Perfect for an easy dessert, breakfast or spooned over your Smith St Paleo Pancake & Waffle Mix (blatant plug). 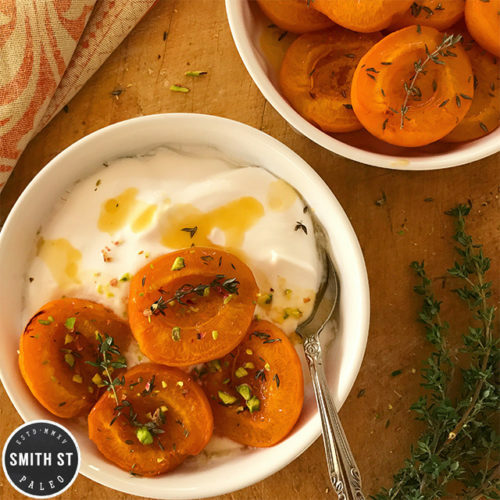 Halve and deseed your apricots and place them cut side up in a baking dish so they fit snugly. Drizzle over the honey and juice. Lay the thyme sprigs on top.